Over time, your studies of each book of the Bible will give you a strong familiarity of God's whole revelation to mankind. You will be able to see how the events of the Bible fit together. You will be better informed and spiritually prepared for the fulfillment of prophecy regarding Christ's second coming. You will build a solid foundation for other studies on specific spiritual lessons and truths. A very important benefit of studying God's Word book-by-book is being able to see particular teachings in their context. Often we can understand the intended meaning of a passage only when we see it in its context. Thus, familiarity with the whole Bible will help you to recognize and resist false teachings. The greatest benefit of studying the Bible book-by-book is that the Bible will become the living Word in you. Anytime you have problems in your daily life, you will be able to quickly find and turn to teachings in the Bible to strengthen your faith and instruct you in what to do. Begin the study of an individual book by reading it all the way through first. When you complete a book you begin to see the whole picture. In fact, we recommend that you read the book you are going to study more than once before you begin writing notes or trying to answer too many questions. This will give you a general impression about the main subject of the book. It will let you know how the author feels [i.e., despair, encouragement, worship, hope, joy, concern, sorrow, humility, judgment, etc.]. Also, your reading will reveal key words and phrases that may be repeated throughout the book. Continue to read and re-read until you understand what the author is saying. This step takes time and patience as well as a desire to know what God's Word says. Use the three rules of interpretation we discussed in the previous lesson. Ask questions, pay attention to the context, and read related Scriptures. Also, notice the literary style, the language, and the organization of ideas. Write notes based on what these things show you. Try to sum up the meaning of the book. This means you should pick out the book's main points and show their relationship to each other in a brief written form. Use your own words. Once you have done this, the book becomes more alive to you. It will become a part of you, a personal "living force". You must allow what you learn about Christ and your relationship with Him to transform your character and your actions. When this happens, your life will be a "light" to others and they will gladly allow you to lead them to Christ. We are going to use the short book of Colossians to practice what you have learned so far. Stop now and read Colossians. Then, reread the book and make notes on your first impressions of the book. Notice how often certain words or ideas are repeated, such as "faith", "set free", "life in Christ". They will help you to identify main ideas. Colossians uses the literary style of a letter. The writer, Paul, is discussing the false teachings about salvation. He uses some figurative language to help the people picture in their minds what union with Christ really means. For example: "See to it that no one takes you captive..." (Colossians 2:8) When we are united with Christ, we are set free from the spiritual and emotional bonds of man-made rules regarding salvation. Salvation is freedom, not imprisonment. We are no longer "captives" or "slaves" to empty religion or false doctrines. What seems to be Paul's mood or feeling as he writes this letter (e.g., irritation, pity, concern, anger)? 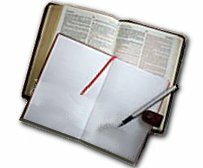 How many times does Paul use the name "Christ" or otherwise refer to Him [Jesus, Lord, etc.] in this short letter? Based upon your reading, write the main idea from the book of Colossians. Read verse 3:11 for help. Paul uses three figures of speech to illustrate the complete change in our lives that comes from union with Christ. Verses 11, 12, and 20 in chapter 2 symbolize this change by __________________________________ (2:11), __________________________________ (2:12), and __________________________________ (2:20). For each main point below, write the organization method [e.g., contrast and comparison, repetition, reasons and results]. It is helpful to put the teaching of a book into context by comparing it with related teachings in other books. If you check the margins of Colossians in your Bible you may see several references to Ephesians. One of these references is Ephesians 2:1-10. In this passage also we read about passing from death to life. Fill in the spaces with the correct words. Ephesians 2:8-10 says, "For it is by _________________ you have been _________________ through _________________. And it is not your own doing; it is the _________________ of God, not a result of _________________, so that no one may boast. For we are His _________________ created in Christ Jesus for __________________________________, which God prepared beforehand, that we should walk in them." Only as you prayerfully consider the teachings in God's Word and respond to them can you really benefit from your study. Knowledge alone is not enough. You must apply what you have learned and allow God to fit your life into His plan. Write in what ways you can live a full life with Christ as illustrated in Colossians. None of us would say that we have arrived at a point where we can claim to be living 100% the life described in Colossians. Yet, God has helped us in the past and today, and we claim His promises for continued help in the future. Concern or love or compassion: Paul feels love for these Christians (1:3, "give thanks;" 1:9, "always prayed for you"). He cares enough for them to suffer (1:24) for them and to work hard (2:1) for them and to encourage them in their faith (2:2). Depending on the Bible version you use, the number is ±50. We receive full life through union with Christ. Christ is the "key" to our lives (2:3). Christ is mentioned at least 38 times as Christ, 12 times as Jesus, Lord, or Son, and many times as "He" or "Him". Repeated words help to identify main ideas. circumcision faith burial faith death: all these suggest being set apart. body faith head faith new clothing. Repetition: The idea of being raised from death to life is mentioned in each verse. Reasons and results: As a result of our new life, we are all the same in Christ ("Christ is all, Christ is all in all"). Contrast and comparison: Our death to sin (2:20) is like putting to death our earthly desires (3:5) just as our life in Christ (3:1) is like putting on a new self (3:9, 10).